It’s salutary to be reminded that Tartini’s Sonate piccole form part of ‘one of the largest integrated sets of sonatas for any instrument’. Though he’s popularly associated with the Devil’s Trill, and nocturnal dreams of hyper-virtuosity, Tartini was also very much the theoretician, and his investigations into the harmonic and mathematical structures of music are important pieces of investigative scholarship. He worked on the Sonate piccole for many years and they are predicated on ‘nature imitation’ with true bass implications but without the necessity for a written bass. Peter Sheppard-Skærved’s own critical edition will be forthcoming soon – there is none other, apparently - and it will be based on the manuscript held in the library of the Basilica of S. Antonio in Padua. In his view there are 30 sonatas in Tartini’s hand, not the previously estimated 26 and I assume that all will be made available by Toccata. 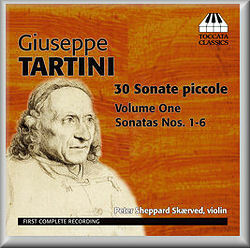 The intrepid soloist also notes that he has gone for a close-up recording quality, the better to heighten the dramatic harmonics and other effects that Tartini envisaged. Sonatas 1 to 6 are full of many dramatic and expressive movements. These range from the fanfare overture of No.1 with echo effects, through its Allegro, which originally served as a finale, but is actually followed by a Gigue. Tartini’s ability to explore remarkably forlorn harmonies is amply audible in the Siciliana of No.2 which is followed by a more military Allegro and a finale that is amply ‘affetuoso’ which, though slow, bristles with technical demands. Tartini is effective at calls to arms in these sonatas, as he also is when laying out the music’s more interior landscape – of which the opening of No.4 is an obvious case in point. The singing cantabile invocations prefigure the elegant line of the French school yet to come, a line that ran from Tartini to Kreutzer, Rode and Baillot. Tartini is certainly capable of springing a surprise. Noteworthy amongst these surprises is the unadorned simplicity of the quiet Grave from the fourth sonata, which contrasts with the surrounding movements which extol the virtues of folklore in their dialogues. The second movement of No.5 explores the communicative wit of which Tartini was a master as well as, more specifically, the birdsong that animates some of the sonatas. The following Allegro assai is a triumph of the songster’s art, sounding like a mid-eighteenth century children’s song. Throughout these sonatas, indeed, effect and affect go hand in hand. The main question in terms of the recording is the sound. This, as suggested, is very close and resinous. It’s what the soloist hopes is a true ‘Tartini’ sound. Some will find it just too abrasive but I certainly found it exciting, indeed at points combative.